You can't beat classic hummus. Especially homemade - it’s one of those foods that tastes way better than store-bought varieties (which can be pretty damn tasty to be fair). 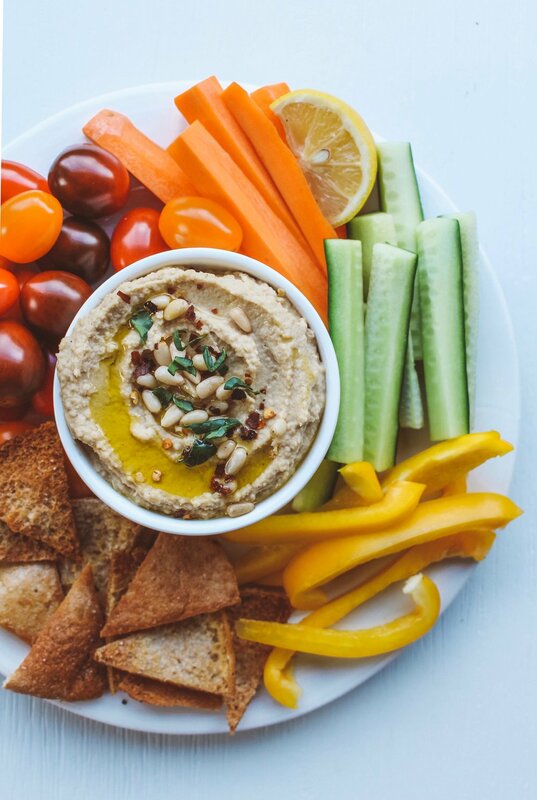 Originating from the historical Levantine cuisine (Eastern Mediterranean ) hummus is a popular spread/dip made from a combination of chickpeas, tahini, lemon juice, olive oil, garlic and salt, that has been blitzed into a smooth (or chunky, depends how you like it - you do you) paste. When prepared with these traditional ingredients, it's superbly nutrient-dense and with a myriad of health benefits - it's rich in belly-loving dietary fibre; antioxidant-rich ingredients that help fight free-radical damage within the body, like olive oil and tahini; it’s a source of plant-based protein, it’s good for those with dietary intolerances as it’s naturally gluten, dairy and nut free; and it has a low-glycemic index - meaning it will release its energy slowly into your blood stream, leaving you sustained for longer *insert thumbs up*. Serving wise, it’s really easy to weave into your diet! Enjoy it with fresh veggie sticks, as a nutritious sandwich spread, as a big dollop on top of a salad, spread over a rice cakes as a snack or even just classic chip-and-dip style. This recipe uses roasted garlic which adds a whole new dimension to the humble dip. While you can totally use raw garlic - I have may times, and it’s delicious - roasting garlic brings a nutty, sweet taste, and makes it a little less pungent, which is always a good thing when garlic is in the equation. If using raw garlic make sure to reduce the number of cloves to 4-6. Add 4 to start, blitz, taste-test, then add more if needed. Let your senses to guide you! 1. Preheat oven to 220 degrees celsius. Cut the top and bottom off each garlic clove, leaving the skin still on. Lightly toss cloves with a drizzle of olive oil, and then wrap in tinfoil. Bake for one hour (get ready for the most delicious smell to waft through your house!). 2. Open your tins of chickpeas, pour chickpeas into a sieve, drain liquid, and rinse well with water. 3. Add all ingredients to a food processor (expect salt). For the roasted garlic, simply squeeze garlic out of its skin! Discard skin. Process for a few minutes, stopping to scrap down the sides. It will look quite thick and chunky. 4. Add the salt (and any extra spices - paprika, cumin…) and blend until smooth. Add a few tablespoon of water if you'd like a smoother consistency. 5. Taste test and season with extra salt or spices to your liking. 6. Transfer hummus into a bowl. Drizzle a little olive oil on top, and garnish with fresh herbs and chopped nut (if desired). Serve with a platter of colourful fresh veggies. Storage: keep hummus in an airtight container in the refrigerator for up to five days. .